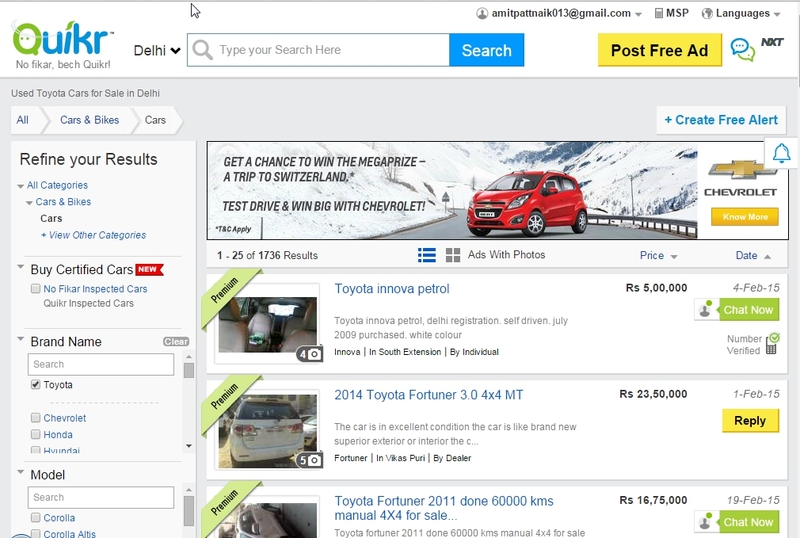 Home » Useful Apps and Services » Got My Dream Car with Quikr Nxt! Selling your old car for a new one is easier said than done. Getting separated from your beloved car can be hard actually, more so, if it had been there with you at most of the important occasions in your life like marriages, family re-union parties, holiday travels etc. We all get emotionally attached to our vehicles, don't we? Thus it's not easy to break the healthy emotional bond that would have already been forged between us and the car. It was in 2008 when I got my first promotion in job and so with it, got a raise in salary as well. 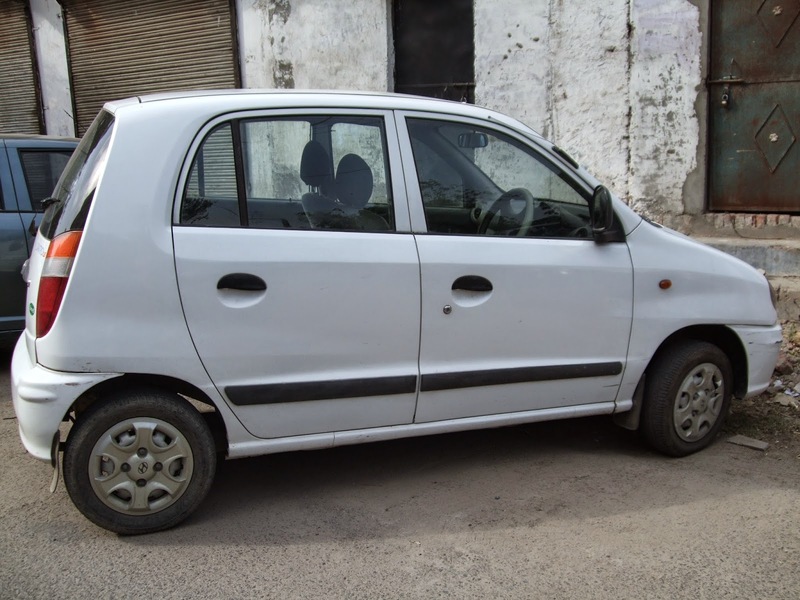 But I was doubly excited about it because with my salary having got hiked, I thought, I could then easily afford to buy my own car in just a few months, and the very one that I was keen to buy - Hyundai Santro. Like most people, I too had always longed to own a car and so I had been saving for it for sometime. My dream turned into a reality, after two months, when I finally managed to buy myself a car - a brand new Santro. I was a bachelor then and so was looking for just a small, cosy car to be my companion on roads. My Hyundai Santro fitted the bill to a tee. Within no time, it became an indispensable part of my family. It never troubled me nor did it ever fail me when I needed it the most at the crucial junctures, like if I was already late and needed to reach my office at the earliest, or if I needed to go and drop someone somewhere as fast as I could so that they didn't miss their exam or their flight/train. But sadly, there comes a time when it has to be replaced with another car because (old) cars do not last forever. I am now a married person with a daughter too. So to accommodate six persons (my parents, my kaaki maa, my wife and my daughter) in my old car was no longer feeling comfortable. Also with technology changing and improving every other day, a new car always comes with more features, so much that it becomes irresistible at times. My 6 years old car had seen better days and it was time for me to move on to a bigger vehicle - a SUV. But after having taken care of my car like a part of my family, I couldn't have sold it off to just about anyone for money. I needed to make sure that I was leaving it in good hands and not to an uncaring owner. I also had to make sure that there were no legal ramifications later on. 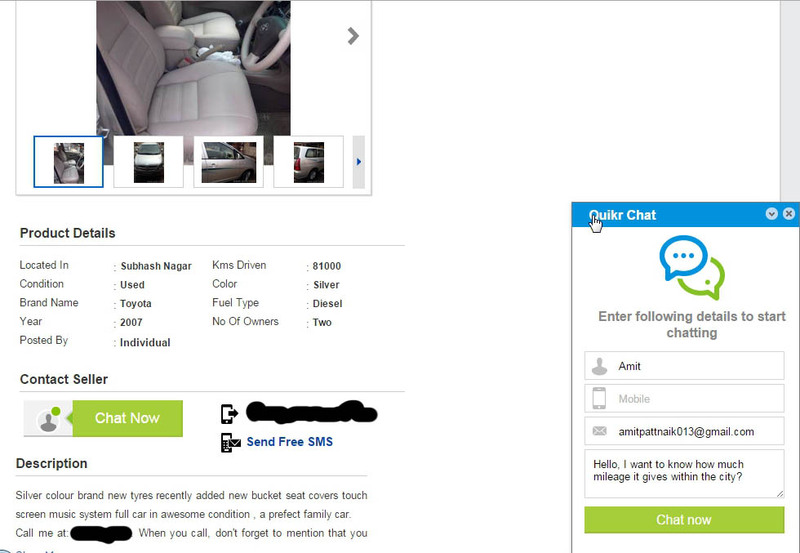 So I had to look for a reliable place to sell my car and what better place to go than Quikr, where one finds only genuine buyers, whose background credentials too would have been checked. So I did just that -- I took photos of my car, uploaded them on Quikr and wrote a nice little description of my car. That was it. My ad was running live within a few minutes and I started getting inquires about my car from various prospective buyers in the next few days. But now with the Quikr Nxt chat app, it has even got simpler and convenient to discuss with the buyers, without having to share one's phone number. Moreover it is free, unlike the earlier phone calls. Now one need not have to spend a paisa on calls. Also with this new chat feature, a seller can now share even pictures of his product with his prospective buyer, if he asks for additional information. And the best thing of all is that the Quikr Nxt provides one with privacy because not everyone feels comfortable to share his/her phone number with a complete stranger on a publicly visible website. Of all interested parties with whom I chatted, I finally zeroed down to one particular young man who seemed to be very knowledgeable about cars and he also came across as someone reliable as far as payments were concerned. I also felt that I could trust him to take good care of the car after I sold it to him. Moreover, he was also offering me a good price. So we discussed at length all about the my car, about its insurance, its engine, its AC functionality, the total distance that it had traveled so far, we discussed everything in details on Quikr NXT. And when he got satisfied with all his doubts and queries having been answered, we decided to finally meet each other at my place on a particular date to close the deal. We met on the pre-finalised day, he took a test drive as well and having got satisfied, he handed over the money as well. After the legal formalities were done, I handed over my car to him and he happily drove it away. Thus I gave my old friend to its new owner. But now it was time to get another member to my family - a bigger car - a SUV. But I didn't want to invest a lot of money in buying a new one. 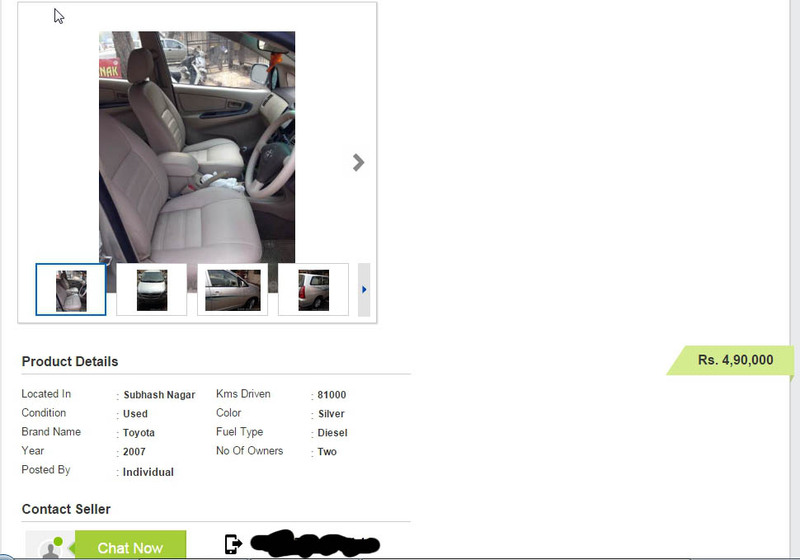 I knew, with Quikr, it was not that difficult to get a second-hand SUV in absolute good running condition. It was just a matter of a few clicks and a few chats (it just needed a few more Quikr NXT sessions with prospective sellers). And it panned out just the same way as I had thought. I was looking for a Toyota Innova for my big family. 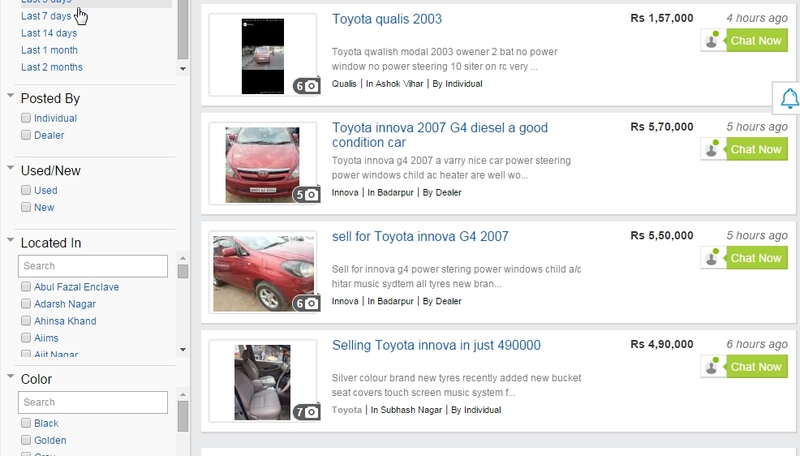 So I went through all the ads that owners had posted on Quikr for their Toyota Innovas and after having a good look at all the ads, I eventually found one particular one that was meeting all my criteria. So I decided to contact the owner. To my luck, he was online at that time, as the yellow light on Quikr NXT app suggested. At once I clicked open the Quikr NXT chat box and typed in my queries. The seller too was happy to answer all of them and in the next hour or so, we reached upon a deal. We both agreed upon a price and decided to meet at the earliest to close the deal. As decided, we met at his home after two days. He showed me the car and once again described to me all of its features in details, he let me have a test drive as well and the SUV fully met my expectations, just as I had thought. So I paid him the agreed upon price for the car and in return, he handed over its keys to me. The legal formalities and the paper work too were done in quick time. And thus I got my new companion for road, my Toyota Innova, without breaking a sweat. All thanks to Quikr NXT, the entire exercise of selling my old car as well as buying the new one was absolutely smooth and hassle-free. 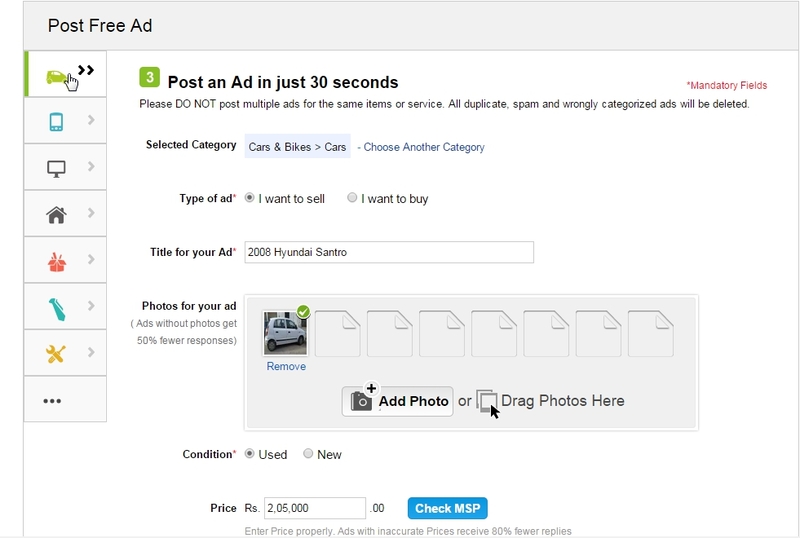 This blog post is an entry for the "Get a better Car with Quikr NXT!" contest organised by Quikr in association with Indiblogger.in.